It definitely can’t be called a pleasing dish – a bowl of aromatic curry with a fish head staring back at you – but it is a popular delicacy across Southeast Asia, India and certain other coastal regions in the world. Get past the initial fear of those prying eyes in your bowl and you will soon discover that the fish head curry is surprisingly comforting, luring you easily into its flavourful spell. But truth be told, one needs to develop a taste for it, much like foie gras or caviar, and the guts (pun unintended). In Singapore and Malaysia, the head of red snapper (ikan merah) is lovingly cooked in a pot along with assorted veggies and noodles to make a nourishing broth. There are of course variations to it; some add in coconut milk for a rich texture while some tip in bird’s eye chillies or hot sauces to turn up the heat. In Peranakan cuisine, of the early Chinese migrants who have now settled in Singapore and Malaysia, fish head curry is a signature dish, served during family meals or feasts. 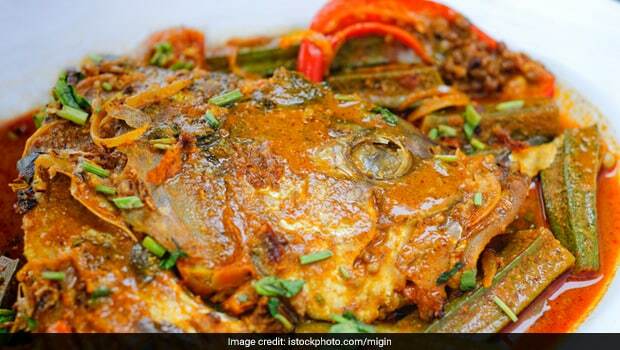 Coming back to India, the people from East, Northeast and South also use fish heads to prepare a range of dishes to spruce up their regular diet. The usage of the fish cut, which is otherwise discarded, probably stems from the hunting custom of paying respect to the entire animal before killing it for food. In fact, even parts like fish eggs and intestines are used in making bora (fritters), bhaja (stir-fries), et al. Besides these parts do have interesting flavours, which can be used for various recipes. In Bengal, a most loved dish is the Muri Ghonto, served usually during lunch. It can be referred to as a pulaobut made with fish heads, mainly of Rohu or Katla. It is easy to make, requiring just a handful of ingredients. The fish heads are first coated with salt and turmeric and fried till done. In the same pan, onions, ginger garlic paste, chillies, bay leaves and other spice masalas are sautéed before adding the rice and fish. Finally, some amount of water is poured in and the lid is placed over the pan to let the dish slow cook and develop its lip-smacking flavours. Variations of this dish are also seen in Orissa, Assam and Bihar. In Assam and other Northeastern states, the fish head is cooked with a range of seasonal veggies to make quick stir-fries. A variant of the Khar, which is a beloved Assamese dish made using an alkaline extract from banana ash, also sees the inclusion of fried fish head, but it is scrambled in the dish. Accompanying veggies could include cabbage, eggplant, pumpkin, potatoes, spring onions and other indigenous saags. Head to the Malabar and Konkan regions and fish head preparations make an appearance again, where sea fish like Mackerel and Kingfish are made into spicy curries, and served with steamed rice. Flavours are built in the pot using spices like black pepper, chillies, cloves, coconut milk, ginger, garlic and coriander among others. Besides flavour, fish head is also a powerhouse of nutrients. According to some experts, the fish head which contains bones, brain, cartilage and fat, is a great source of Vitamin A, omega 3 fatty acids, iron, zinc and calcium. If one were to believe folklore, it is also considered to boost brain power, and hence growing children are encouraged to eat fish heads regularly. In case you were wondering how to go about preparing a fish head curry at home, we present a Goan delight to please your taste buds – Goan Fish Head Curry. Now that you have a new task at hand to perfect in your kitchen, let us know the delicious ways you plan to undertake to create fish head dishes at home. Happy cooking!